From software-driven verification to production operating systems and applications, embedded software fulfills an array of needs. With this increased dependence on software comes a need for a more efficient way to develop and debug these different types of software, not to mention any hardware bugs identified by the software. With the Cadence® Indago™ Embedded Software Debug App, you get the performance and model accuracy you need for both development and application of embedded software. Say, for instance, that you’re developing software for hardware verification. In this case, you might want a fast development platform for better productivity. But since the software is testing the hardware, you’ll ultimately need to run it on a fully accurate platform. Indago Embedded Software Debug App meets both requirements, providing a consistent debug environment across platforms and processor model abstractions. When you’re doing detailed debug of the hardware and software interaction, it’s important to have visibility into the hardware activities and how they are synchronized with the software. 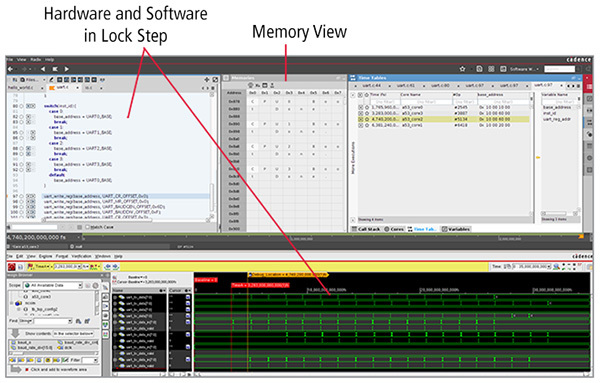 As shown in the figure below, the Indago Embedded Software Debug App uses post-process analysis of hardware and software trace information to provide the most accurate combined views of the hardware and software. With the complete context of software execution in front of you, you’ll find it easier to locate the root of the problem. The app is part of the Cadence Indago Debug Platform.